Irish t-shirt features the Jameson Whiskey logo. This Irish t-shirt features the Jameson Whiskey motto Sine Metu. Sine Metu is Latin for without fear. This Jameson t-shirt features the logo of the famous Irish whiskey printed on the chest. 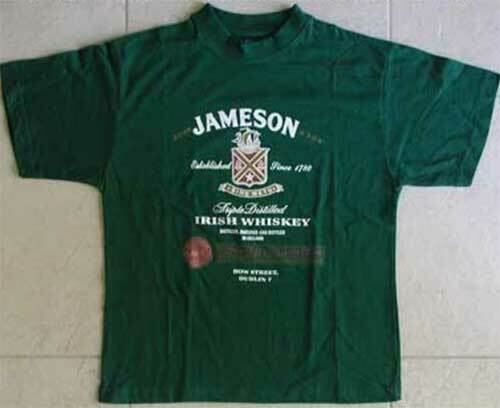 The green Irish t-shirt is pre-shrunk cotton and it is an officially licensed product of Jameson Whiskey, This Jameson merchandise is just one of the many Irish t-shirts that are available at The Irish Gift House. Irish t-shirt is a black design features the Jameson Whiskey motif. Jameson Irish whiskey rugby shirt is an embroidered short sleeve jersey that is made of a breathable fabric.